Gates Town Hall is located at 1605 Buffalo Road, Gates, NY 14625; phone: 585-247-6100. Photo: Franklin-Hinchey House, ca. 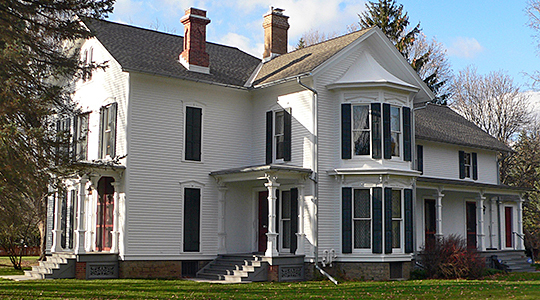 1870, 634 Hinchey Road, Gates, Monroe County, NY. Listed on the National Register of Historic Places in 1983. Photographed by User:Ammodramus (own work), 2011, via Wikimedia Commons, accessed January, 2013. Named in honor of General Horatio Gates, the town was formed March 30, 1802 as Northampton. The name was changed in 1812. Parma and Riga were taken off in 1808 and Greece in 1822. The Genesee River forms a part of the boundary to the southeast. The first settlement was made in 1809 by Isaac Dean, from Vermont. John Sickles and Augustus B. Shaw came in the same year. Among other early settlers were Ezra Mason, Richard, Paul, Philip, Lisle and Lowell Thomas, all of whom came to town in 1817, or earlier. William Williams settled here in 1819. Ira West kept the first store, and Isaac Dean erected the first mill. In 1865 the town's population was 2,783.